Rigid PCBs are something you will encounter almost everywhere. Their applications range from small electrical devices to large aerospace, military and medical fields. Next if we talk about ‘Flexible PCBs’, they are built of flexible substrate as opposed to rigid PCBS, and have more advantages too. They have lower thickness, have lighter weight, are dynamically bendable, can save space and are more accessible for 3D interconnection assembly. They also have equally vast applications because of their excellent electrical and thermal performance. 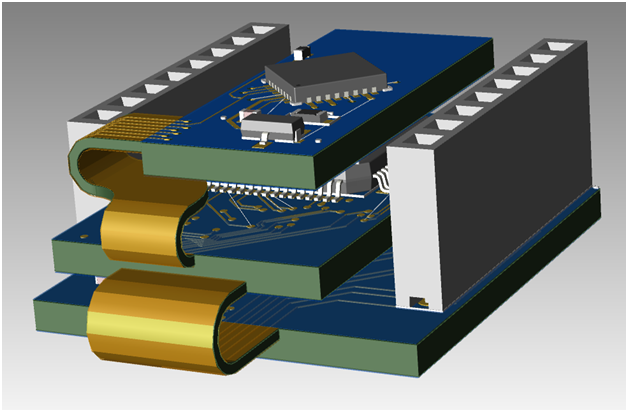 The next major type is the ‘Flex-Rigid PCB” built through further development and optimization of flexible PCBs. We will discuss the properties, manufacturing and applications of Flex-rigid PCBs. But first let us generally describe Rigid-flex PCBs. Flex-rigid PCBS are boards using a combination of flexible and rigid board technology. They consist of multiple layers of flexible circuit substrates attached to one or more rigid boards either externally or internally. The substrate material is what gives the flex-rigid PCB its properties. It usually contains a flexible dielectric film and a flexible adhesive film. The flexible dielectric film mainly includes polyester, polyimide, and flouropolymer.Polyimide is the most common type and has the highest dielectric constant and excellent electrical plus mechanical properties and shows resistance to high temperature. Polyester on the other hand, does not show good resistive properties to high temperature. Flouropolymer is used in high frequency applications such as military and aerospace products and has a low dielectric constant. The adhesive film mainly includes acrylic acid, epoxy and polyester. Acrylic acid and polyester show high adhesion, flexibility and heat resistance. However due to its large coefficient of thermal expansion it should not be over 0.5 mm thick. Epoxy shows bad adhesion and is mainly used in sticking the covering and internal layers. The manufacturing technology varies for each type of PCB. The most popular advanced PCB boards include HDI flex-rigid PCBs and embedded flex rigid PCBs. The essential difference is the fine circuit manufacturing tech and microvia manufacturing. Flex-rigid PCBs are built using layers of rigid and flexible PCBs with pleated through holes between them. Flex-rigid PCBs help to reduce the volume and heat problems caused by replacing harness and connectors. Originally in the 1970s, Flex-rigid PCBs were built by stacking rigid board onto flexible board. Today they are built by using glass fiber epoxy resin (FR4) as an external rigid board on which solder mask is applied to protect the PCB. For the flexible substrate, polyimide double-layer board is used as core and a polyimide/acrylic film is used to protect the circuit pattern. The adhesion depends on the low-flow prepreg. In the end the PCB is laminated to give the final result. Flex-rigid PCBs have excellent electrical performance and mechanical properties, so they are accessible for 3D assembly. They are perfect for use in devices that need to be bent. The flexible substrate is what makes it fit for high frequency signal transmission and impedance control while resisting high temperature and extreme environment affects. These PCBs are actually hard to manufacture and repair. During manufacturing, the rigid base is embedded into expensive flexible substrate material so the raw material waste is high and the manufacturing difficulty. Embedded flexible PCBs are manufactured by embedding flexible circuit units into internal rigid boards and so on. The connections usually depend on blind and buried vias as interconnections are no available. These PCBs contain the advantages of HDI and rigid PCBs and also reduce substrate material waste. 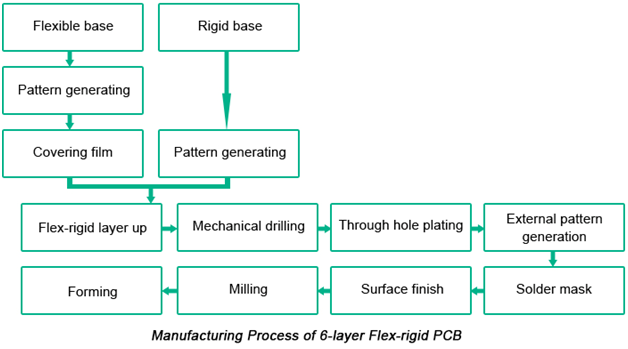 Embedded flux PCBs are manufactured by embedding flexible circuit and then layering. The flexible substrate material usage is increased for flexible circuit unit. No electrical connections are available between flexible and rigid circuits in the same layer. Embedded flexible PCBs help to increase flexible substrate usage rate as the substrate material waste is reduced. Our Online PCB Quote and Order System allow you to get PCB production price within seconds. Click Here to Visit our quote page, and then fill in your circuit specification. if your high-density PCB project requires specifications not listed in quote page, feel free to reach us for solutions.